Atlanta Piano Fortissimo provides in home violin lessons by highly qualified instructors in the comfort and convenience of your own home. Introducing the violin as a new instrument for a child can be an extremely rewarding process for both the student and parent, with a little patience and the right type of instruction. One common inquiry among parents is what age to start a child on the violin. There is no single concrete number for this, as it depends on the personality of the individual child. At 5-7 years of age, most children are in a state of focus that’s conducive to successful lessons. Some children have been known to do well starting at 3-4 years of age if they commonly participate in other activities that require focused attention for thirty or more minutes of time. These children have a better chance of taking the instrument seriously if they develop a personal interest in the instrument, rather than being nudged into the activity. To lay the groundwork for an interest in music, consider playing violin music around your child and asking questions about the music. It isn’t necessary to be technical with the conversation. By simply asking about your child’s favorite part in a song, you may spark a hidden curiosity. Take a child to an orchestra performance, or request to sit in on a music class. These more hands on activities could light the fire of interest in music for your child. If a student is excited to learn, they will be more likely to put the necessary time into the instrument. Starting violin lessons at a young age is rewarding in countless ways. It improves hand eye coordination, since you’re working with both sides of your body as well as your mind to sync up the movement of your fingers with the strokes of the violin bow. It also helps put a child in the habit of straight posture, which is the correct form for sitting with the violin. As a child begins to read music, it can reflect and enhance their abilities in reading other written languages. When considering the route of violin lessons for your child, you have two options: rent or buy. We recommend initially renting an instrument for a young child. Most rental plans turn into purchase plans if the child has continued interest over the years. A retailer will measure your child’s arms for the appropriately sized instrument, and this size will change as your child grows. Renting allows you to exchange instrument sizes without having to buy and resell smaller violins as your child grows and develops. If you purchase a violin, it is very important to read reviews for the store or online retailer. For in person purchases, ask to see the bow tightened and loosened, as some cheaper bows fall apart with the first tightening of the hairs. If you decide to go the route of an online purchase, make sure to read the fine print, as many violins are shipped in pieces, and you will have to take them to a music retailer to have them put together once the package arrives. Once your child begins lessons, the instructor will carefully mark the instrument with thin strips of tape to begin to train your child’s fingers to find the correct places on the strings. These tapes are typically removed over the course of a few years, depending on the age and progress of the child. The student will first learn to pluck the notes on the strings, to become acquainted with the pitches, then slowly they will begin to pick up the bow and use it regularly on the strings. 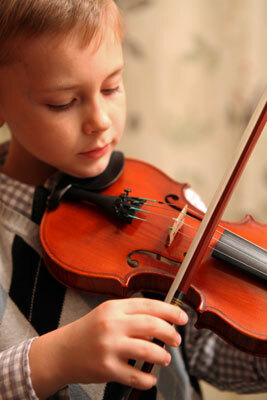 The violin can be a wonderful instrument for a child to develop an interest in. With a little knowledge and a lot of encouragement, your child could uncover a great love for music they never knew existed within them. If you'd like to take music lessons in the comfort and convenience of your home, get started by registering online.